It is with sadness that we announce the passing of esteemed Holy Apostles College & Seminary professor and former vice-rector, Msgr. David Quentin Liptak on Monday, January 1, 2018. Msgr. Liptak was ordained a priest for the Diocese of Hartford in 1953. 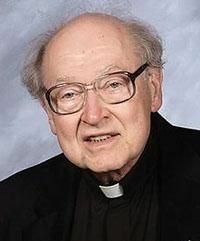 His sister, Sr. Dolores Liptak, RSM, expressed that her brother wanted nothing more than to be a priest and he “lived primarily to be a priest…down to the very last moment of his life.” He was an accomplished author, editor of the award winning diocesan newspaper since 1954 until his retirement in 2016, and beloved professor. In learning of his passing, many of the faculty and staff have shared their memories of Msgr. Liptak. The visitation will be held at the Cathedral of St. Joseph, 140 Farmington Ave., Hartford, CT, on Thursday, January 4 from 2:00pm to 5:00pm. Most Rev. Leornard P. Blair, Archbishop of Hartford, will preside at the funeral liturgy on Friday January 5 at 11:00am at the Cathedral of St. Joseph. Cards may be sent to Msgr. Liptak’s sister, Sister Dolores Liptak, RSM, 89 Woodmere Rd, West Hartford, CT 06119.